1905 St. Mary’s Church, Huntington Beach (at that time called “Pacific City”), is established as a mission of St. Joseph’s Parish, Santa Ana. The first Mass is celebrated in Sunby’s department store on Main St. The priest travels down Pacific Coast Highway from St. Anthony’s, Long Beach, in an electric automobile. Huntington Beach population: 582. 1908 A Protestant Church (with house) was purchased by St. Mary’s at Tenth and Orange streets in Huntington Beach. The congregation sat on planks and boxes. They used the small house as a Parish Hall. 1912 The mission becomes St. Mary’s Parish and is officially established with appointment of the first pastor, Fr. Andrew Reynolds (by the Diocese of Monterey-Los Angeles, which at the time covered all of California south of San Jose). 1921 The name of the parish is changed to SS. Simon and Jude. 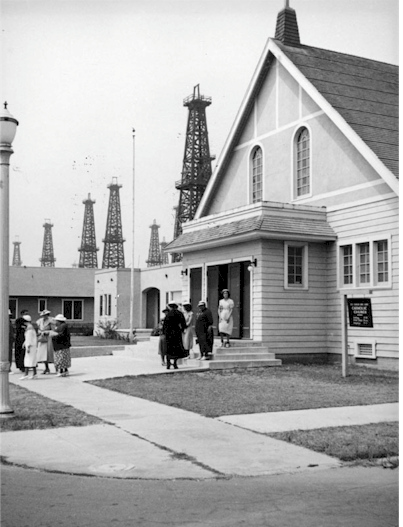 1923 The first Church was sold and moved off the property, and the new SS Simon and Jude Church (seating about 300) and rectory were constructed at Tenth and Orange (later St. Mary’s by the Sea) at a total cost of $21,000. 1964 The Franciscan Friars are asked to staff the parish by the Archdiocese of Los Angeles. The first Franciscan pastor is Fr. Colman Colloty, OFM. The Mass is in English for the first time. 1965 The northwest corner of the parish is cut off to form St. Bonaventure’s. 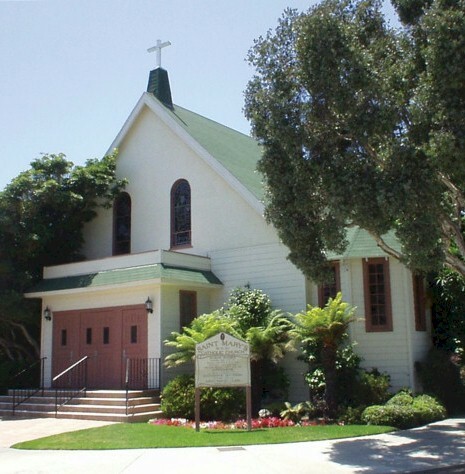 1976-2015 In 1976 the Diocese of Orange was established, and the parish officially became St. Mary’s by the Sea Church. Father Daniel Johnson was assigned here in 1978. Father Johnson celebrated his 50th Jubilee here in 2004 after seeing the parish grow from about 400 people to over 1500 families. Father Johnson walked through the whole parish almost five times during his 25 years here inviting fallen-away Catholics and other interested people to come to Mass. Father Sy Nguyen was our Administrator from 2004-2005, Father Martin Tran from 2005-2009, Father Joseph Luan Nguyen from 2009-2011 and Father Quang Vinh Chu is our pastor.